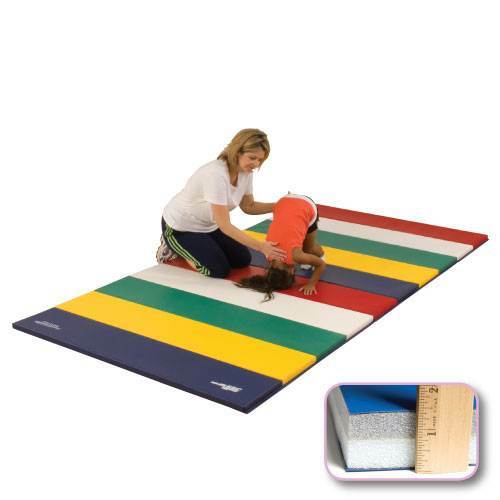 Fasteners On Ends Only 4' x 6' x 1 3/8"
Fasteners On Ends Only 4' x 8' x 1 3/8"
Teach little gymnasts how to tumble properly with help from the GSC Cross-Linked Foam Rainbow Mat. Students will be able to practice cartwheels and handstands safely thanks to this mat's cross-linked foam core and smooth vinyl covering. Each 1 ft. panel is wrapped in a different color for an overall rainbow effect, adding a touch of whimsy to your recreational facility or gymnastics center. Multiple mats can also be connected if necessary using the hook-and-look fasteners on each end. ONE FOOT PANELS AND 18 OZ. VINYL! Each 1' panel is covered with a different color of 18 oz. vinyl. Mats fold easily in 2' sections. Includes hook-and-loop fasteners on both ends. Filled with 1 3/8" cross-linked polyethylene for high impact activities. 1' panel mats lie flatter than 2' panel mats.